PORTLAND -- Over the last two seasons, the Portland Trail Blazers have tried to become a more well-rounded team. From vastly improving their defense to being less reliant on the starting backcourt, the Trail Blazers have made strides in terms of being able to win in a multitude of ways. But sometimes, such as Thursday night versus New Orleans, reverting back to being a team that wins almost entirely with offense works, too. On a night where neither team was playing their best at the defensive end, the Trail Blazers made 18 three-pointers to defeat the Pelicans 132-119 in front of a crowd of 18,921 at the Moda Center. “In some ways, this was a frustrating game," said Trail Blazers head coach Terry Stotts. "We never really got on track defensively. The offense was good all night. A lot of good performances offensively, but defensively, for whatever reason, a lot of it might have been New Orleans playing really well, but I’m glad we strung together some stops in the fourth quarter and we were able to pull away." Portland is now 6-2 overall and 3-1 at home this season and have won three-straight, a milestone they didn't achieve until late November last season. With Pelicans power forward/center Anthony Davis sitting out Thursday night's game with a sore elbow, one might have expected the Trail Blazers to easily dispatch a New Orleans team playing on the second night of a back-to-back. But Pelicans forward Julius Randle had other ideas. The fifth-year forward out of Kentucky, who signed as free agent this offseason with New Orleans, went 4-of-5 from the field and 6-of-6 from the free throw line in the for 14 points in under six first-quarter minutes. "That’s what we’ve grown accustomed to seeing because I think he’s very capable of that," said Pelican head coach Alvin Gentry of Randle. "I thought he took the ball and was very aggressive with it, I thought he ran out and did some things in transition that were really good." Behind Randle's bully ball, the Pelicans shot 52 percent from the field in the first quarter, but the Blazers were even more efficient thanks to their three-point shooting. In a harbinger of things to come, the Trail Blazers would shoot 6-of-9 from three in the first quarter to take a 35-31 lead after the first 12 minutes. Randle stayed hot in the second quarter, scoring nine points on 3-of-4 shooting from both the field and the free throw line, while E'Twaun More went 4-of-5 from the field for 10 points. But Portland stayed hot from deep, with Seth Curry, Damian Lillard and Al-Farouq Aminu combining to go 4-of-6 from three in the quarter to help Portland take a 70-65 lead into the intermission. "Guys who practice threes, if you’re open, it’s a good three," said Stotts and as evidenced by eight Trail Blazers making at least one triple Thursday night. "Caleb (Swanigan) practices them, Zach (Collins) practices them, Nurk practices them, so if they’re open and uncontested, it’s a good shot... I don’t think they’re out there searching, I thought it was within the rhythm of the game." Portland's three-point accuracy waned in the third, though Jusuf Nurkić made up for the dip in team percentage by going 4-of-4 from the field, including a three-pointer, and 1-of-1 from the line for 10 third-quarter points. But Nikola Mirotic would do nearly the same, scoring 10 points on perfect shooting from the field, to negate the advantage and cut Portland's lead to 102-99 going into the fourth quarter. But between Portland's improved defense and New Orleans perhaps feeling the effects of playing the night before versus the Warriors, the Trail Blazers held the Pelicans to 35 percent shooting from the field and less than 30 points in the quarter for the first time Thursday night. 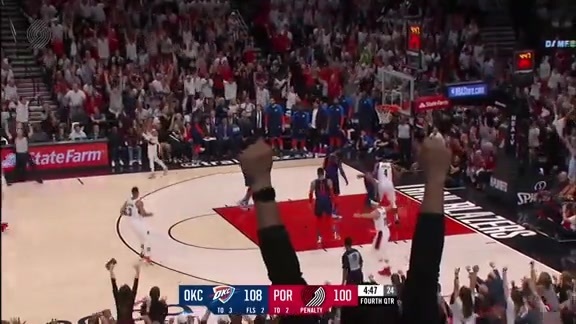 They also managed to make 11-of-19 shots from the field and 5-of-9 three-pointers, with two of those coming from Zach Collins, to outscore the Pelicans by 10 in the quarter to come away with the 13-point victory. Damian Lillard led the Trail Blazers with 26 points (7-16 FG, 4-7 3-PT, 8-8 FT) to go with seven rebounds and six assists. Jusuf Nurkic scored 20 points on 7-of-9 shooting (1-1 3-PT, 5-6 FT) to go with nine re- bounds and two assists. It was his second straight game with 20-plus points. Al-Farouq Aminu scored a season-high 17 points (6-11 FG, 2-5 3-PT, 3-3 FT) to go with 10 rebounds and one block. It was his second double-double in the last three games and his third of the season. Nik Stauskas scored in double figures for the third straight game, finishing with 10 points (4-6 FG, 2-3 3-PT) and three assists. Julius Randle led all scorers with 29 points on 9-of-16 shooting from the field and 11-of-12 shooting from three to go with six rebounds and three assists in 26 minutes. E'Twaun Moore finished with 19, Nikola Mirotic put up a double-double of 18 points, 13 rebounds and Jrue Holiday added 17 points on 5-of-14 shooting. • The Trail Blazers scored a season-high 132 points. It was the most points Portland has scored since a 137-105 win over Golden State on Feb. 19, 2016. • Portland made a season-high 18 three-pointers (of 35, 51.4%). The Pelicans shot 27.6% from the three-point line (8-of-29). • The Trail Blazers outscored the Pelicans on the fast break, 16-6. It was the most fast break points Portland has scored this season. 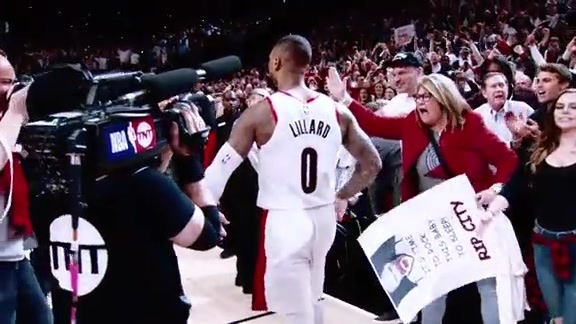 • Portland outrebounded New Orleans, 46-44. • The Trail Blazers bench finished with 50 points. It was the third time this season that Portland’s bench scored 50-plus points. The New Orleans reserves had 51 points. • Portland assisted on 26 of its 44 field goals. It was the most assists the team has had this season. The Trail Blazers begin their first all-home back-to-back since 2013 by hosting the Los Angeles Lakers Saturday night at Moda Center. Tipoff is scheduled for 7 p.m.